1958 was the year of Ngaire and Gerald’s ‘Grand Tour’ of Europe. Ngaire firmly believed in keeping up appearances (who knows what she’d make of me discussing her underwear here) and took so much luggage, including a small suitcase of hats, they could barely move in their cabin. It must have been very warm in the tropics for her to have dropped her standards to this degree. The officers on the other hand, were clearly keeping themselves nice. In fairness, I should make it clear that the underwear she found to be ‘unnecessary’ would only have been her corset. Not that this diminishes the significance of her ditching it. I have travelled in the back of an un-airconditioned Holden Kingswood from Warracknabeal to Broken Hill sandwiched between Mum and Ngaire and can clearly remember the bones in her undergarments sticking into me. If the ship was hotter than the back of that car it must have been unbearable. Fortunately, the ship’s captain wasn’t going to let things get out of hand. Back on with the all-in-one then. 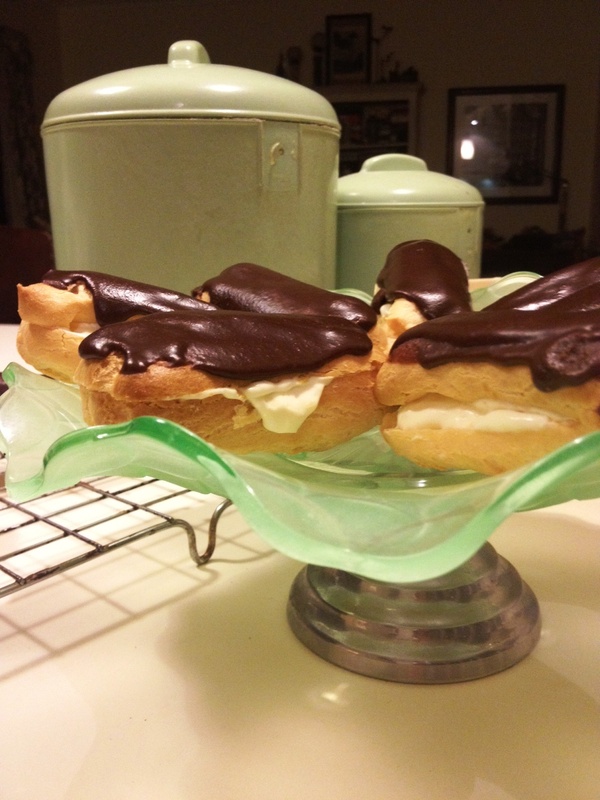 Obviously the only sensible response to a story about battling the bulge is to cook something devastatingly delicious and almost certainly bulge-making: Chocolate Éclairs. The surprise is that they’re devastatingly easy to make. Who’d have thought. Put the water and butter in a saucepan and bring to the boil. Add all the flour and stir very quickly until the mixture leaves the sides of the pan and forms a smooth ball. Cool for about 10 minutes, then beat in the eggs one at a time. I transferred the mixture to my mixer to do this. Put the mixture into a piping bag and pipe 10 cm lengths onto a baking tray (lightly greased or with baking paper). They should be 3 or 4 cm apart. Bake in a very hot oven (I used 230°C) for 10 minutes then turn down to 180°C for a further 10 minutes. Take out and, when cool enough to handle, cut in half lengthwise. Return to the oven for a further 3 or 4 minutes to dry out. They should be golden and crisp. Cool on a wire rack. To assemble, fill with whipped cream (add 1/2 tsp vanilla essence and 1 tsp of icing sugar if desired) and ice with chocolate icing. To make the icing beat together 1 cup icing sugar, 2 teaspoons butter, 2 tablespoons cocoa and about 1 tablespoon boiling water. Best eaten without your corset.